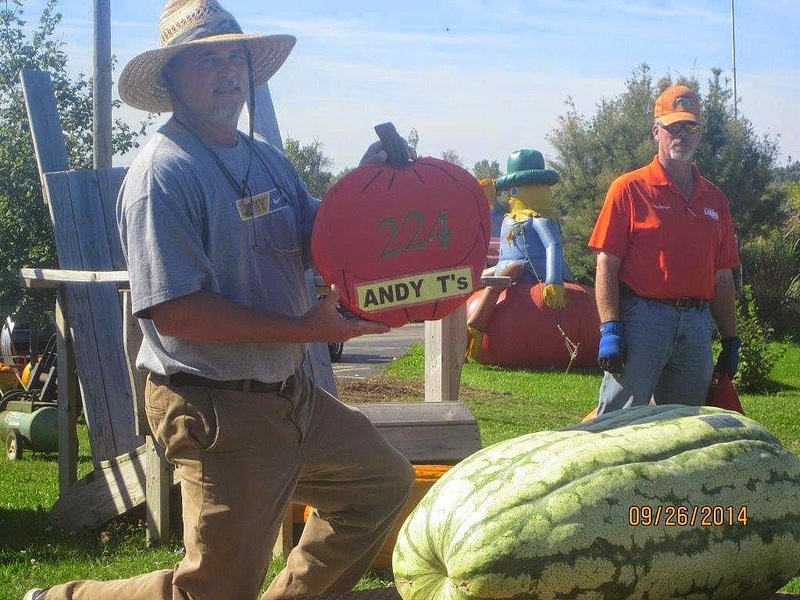 So the weekend before last was the big giant pumpkin and watermelon contest at Andy T’s Farm Market here in St. Johns. It’s an annual event featured annually here in the blog. Why? Because Liquid’s own specialty crop researchers Brian and Tim have entries each year. Sadly I was away and missed it, but Tim’s wife Pauline provided this photo-account. 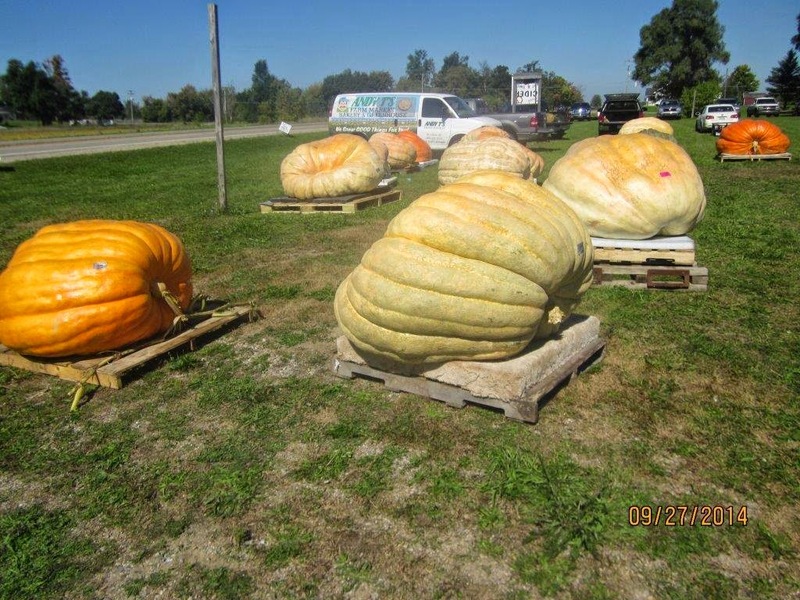 Below are some of the giant pumpkin entrants awaiting the call to the scales. Not sure about the genetics, but I like a bright orange pumpkin compared to the pale ones. But beauty is sacrificed for size it appears. Here is Brian’s pumpkin from Farm 12 of the NCRS. It was a whopping 779 pounds. That was an improvement over the previous years and a good sized gourd. 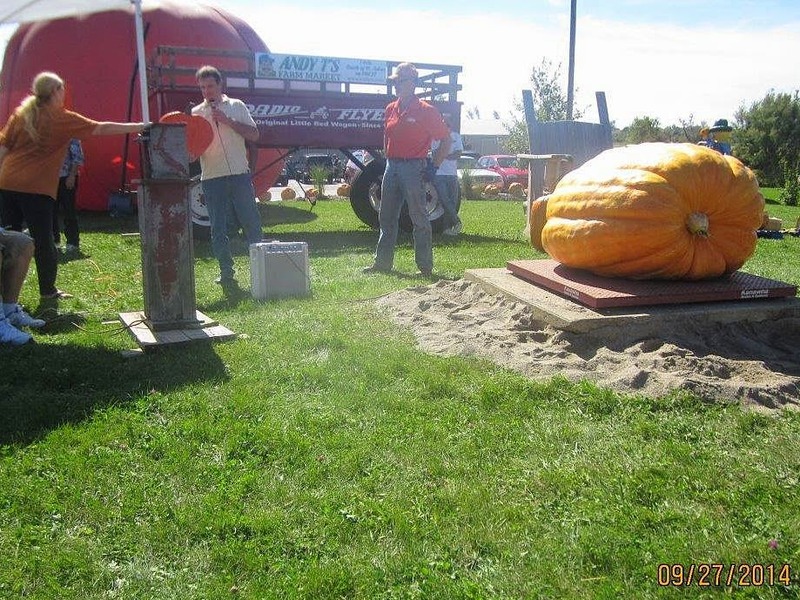 However, first place was 1656 pounds! And second was 1655 pounds! That was a neck and neck finish, or maybe stem and stem. Brian finished in the top half of the 29 the entries which is pretty good. But he has so many other responsibilities at the NCRS that sometimes he missed story hour and morning snack with his pumpkin. I told him to go out next year and shoot for a thousand pounder. But he will be back. But Tim was once again the Watermelon King. He successfully defended his title with a gushing 224 pound melon. Tim grew his with AgroLiquid, but is a little tight lipped with all of his secrets for success. It doesn’t matter, just keep winning Tim. Congratulations! So I’m sure that they already have next year’s contest date circled on the calendar. And you know results will be reported here. So see you next year. On the heels of a cool, wet spring and summer in the midwest the Climate Prediction Center is forecasting a warmer, drier winter for the region, with the driest area sitting over the Great Lakes and extending south through Kentucky and Tennessee. While the deep south, southwest and at least the southern half of the west coast are expected to experience above average precipitation January through March, it’s unlikely to relieve the historical drought griping California’s agricultural bread basket. Meanwhile, the entire west coast is also expected to continue experiencing above average temperatures. Four of the critical stages of high nutrient demand for fruit trees are pollination, early development, mid to late season, and late season/postharvest. During these times, growers should be sure to maintain healthy fertilization levels. Fertilizing for fruit set actually starts the season before during bud development. This year, you’ll feed the buds from the prior season for good fruit set for this season. Fertilization during bud development is important because you can always thin fruit off, but you can’t create blossoms and fruit set if you don’t have it at the beginning. Boron is critical during pollination and early fruit set. Many growers apply a foliar boron spray, particularly during early bloom. Foliar applications are the most efficient method of uptake, and a foliar spray applies nutrient right where it needs to be – on the buds themselves. The buds are a small target, so growers don’t need to apply much. In most cases, only a pound or two of boron per acre per season would be needed. Fase2 growth nutrients during this phase will stimulate growth in perennial crops such as orchards and vineyards. Fase2 promotes fruit set and bud retention and is intended for foliar applications. Early development is largely about nitrogen and phosphorus, applied to produce a good canopy and for the energy to get and hold fruit set. Overall, fertilizer rates will be based on what’s appropriate for the age of the tree and the results of a soil test. Calcium and potassium are the nutrients to monitor mid- to late-season. While every variety will need more potassium during this time, calcium is especially important for Honeycrisp apples. Foliar applications are the way to fine tune a crop, fill in certain growth stages, or deal with a dry period of little water uptake – but start with the soil to get the right balance. As trees will also be setting buds for next season during this phase, micronutrients can be important to apply at this time. Some of the very early season apple varieties and all types of cherries will have a fair bit of growing to do, even into the late season. For these, maintaining insecticide and fungicide applications, even after harvest, will maintain leaves as long as possible and give trees more energy going into winter. Some growers have also been looking into late-season nitrogen as a way to improve spring flush and vigor. Throughout the entire growing season, Pro-Germinator and Sure-K are two main nutrition products that support a balanced fertilizer program. Pro-Germinator is primarily used as a soil application, but it can also be applied as a foliar nutrient. It provides season-long phosphorus availability. Sure-K provides potassium for foliar or fertigation applications, which allows flexible use depending on crop or variety. For those varieties that need additional calcium, Liberate Ca from AgroLiquid can be tank mixed with many other products for efficient source of calcium applications. ST. JOHNS, MICH. — The Grand Opening of the IQhub, a 9500-square foot center for agriculture history, innovation and exploration inside Agro-Culture Liquid Fertilizers’ World Headquarters in St. Johns, Michigan, saw some of the most prominent industry and community leaders in one place Friday, September, 12. Michigan Lieutenant Governor Brian Calley, Michigan House Representative Tom Leonard, Michigan Farm Bureau President Wayne Wood, Michigan Corn Growers Association Executive Director Jim Zook and AgroLiquid’s own CEO Troy Bancroft joined AgroLiquid Education & Outreach Manager Burt Henry in opening comments before moving to the entrance of the IQhub for a formal ribbon-cutting. Both the Michigan Corn Growers Association and Michigan Farm Bureau, along with Greenstone Farm Credit Services and Spartan Insurance Agency made generous donations to the IQhub transportation grant fund in the weeks and months leading up to the grand opening. The grant fund will help cover the costs schools incur in transporting students to and from the IQhub for field trips. The event was attended by the local mid-Michigan community, Michigan educators, members of the press and community leaders such as Congressman Gary Peters (D) of Michigan’s 14th district. The facility features 23 museum-quality exhibits chronicling the changes in agriculture over roughly four-hundred years. Beginning with Squanto’s interactions with the pilgrims and progressing through modern day production and the challenges we face feeding a growing world population. Visitors to the IQhub can immerse themselves in the history — and related innovation — of tillage practices over the years, explore the way water moves through soil, imagine what the world will look like with a population of more than 9 billion people in 2050 and even get hands-on in a cutting-edge tractor simulator. Meanwhile, younger attendees can make the connection between farm and fork in the adjacent Kids’ Korner. There, many of the same concepts are introduced in an age appropriate manner, engaging children ages 4-9 in games, books and hands-on demonstrations to help them understand how agriculture affects their daily life. The IQhub opens for regular business hours beginning Monday, September 15. The center will be open 9:00 – 4:30 pm Monday through Friday and 10:00 – 2:00 on Saturday. Admission is free and transportation grants are available for schools to help cover the cost of field trips to the IQhub. For more information visit the IQhub page, contact Burt Henry at iqhub@agroliquid.com or call 989-227-3850.